In January, Bolivia’s left-wing President Evo Morales began his second term by appointing a new cabinet in which women are equally represented for the first time. Morales, Bolivia’s first president from the nation’s long-oppressed indigenous majority, is leading a revolutionary process of transformation. The 10 women ministers are from a wide range of backgrounds, and three of them are indigenous. Introducing the new ministers, Morales said: "My great dream has come true — half the cabinet seats are held by women. "This is a homage to my mother, my sister and my daughter." In the December 6 national elections, in which there was the highest-ever voter participation in Bolivia, Morales and his Movement to Socialism (MAS) party won a resounding victory. Morales was re-elected with a record 64.2% of the vote and the MAS secured the two-thirds majority in the Senate needed to pass legislation to advance its pro-people program. The proportion of women in Bolivia’s new parliament doubled, from 14% to 28%. Women now hold 47% of Senate seats and Ana Maria Romero from MAS has been elected Senate president. This is a remarkable achievement in the poorest country in South America. It was not until the 1952 national revolution that either women or the 60% of Bolivia’s population that are indigenous were even entitled to vote. Until 1996, women were largely prohibited from owning or inheriting land. MAS senator Gabriela Montano told the BBC on January 29: "This is the fruit of the women’s fight: the tangible proofs of this new state, of this new Bolivia, are the increasing participation of the indigenous peoples and the increasing participation of women in the decision-making process of this country." Morales was first elected in 2005 on the back of five years of massive protests and uprisings — in particular against the privatisation of Bolivia’s gas. Morales’ government has implemented some of the key demands of the people’s struggle — in particular the partial nationalisation of gas and the convening of an elected constituent assembly to draft a new constitution based on justice and equality for the indigenous peoples. The new constitution — passed in a national referendum in January 2009 — guarantees equal rights for women and men, and empowers women and Bolivia’s indigenous majority in all areas of society. Morales and MAS have stated that their goal, reflecting the will of the people, is to build a new state "from below" that is based on three pillars: "plurinationality" (recognition of indigenous equality); regional and indigenous autonomy within the framework of "a democratic decentralisation of power"; and a mixed economy in which the state plays the central role in strategic sectors. At his January 21 inauguration, Morales argued for the need to build a "communitarian socialism" in Bolivia — to replace capitalism’s destruction of life and the planet. Despite women’s traditional exclusion from politics, they were at the centre of the process that brought Morales to power and, with most to gain from the radical changes under way, have become a driving force in the revolutionary process. Thousands of campesino (peasant) women were the backbone of the roadblocks, marches and demonstrations against the neoliberal policies implemented by pre-Morales governments. 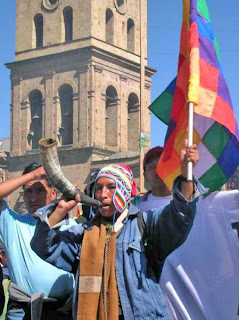 They played a key role in the huge protests in 2000 and 2003 against foreign corporate ownership and further privatisation of Bolivia’s natural resources. Their leadership in the coca growers’ movement and for indigenous land rights has been a motor force of the revolution. Montano told the BBC: "The awakening of women has been brewing for a while. Women have been a key element in the consolidation of this process of change led by President Morales, from the rallies, the protests, the fights. "Now, they will be a key element in affairs of national interest." Bolivia’s women’s movement still has many big battles to win. The power of the Catholic Church means that women are still unable to access safe and legal abortions, and Bolivia has the highest maternal mortality rate in Latin America. Female illiteracy is still around 20% and domestic violence is a major problem, Bolivia’s women’s rights organisations say. Bolivia’s laws establishing women farmers’ right to land ownership are among the most advanced in Latin America. The Morales government allocated property deeds for 164,401 hectares of land to 10,299 women between January 2006 and January 2009 (compared with only 4125 such deeds between 1997 and 2005). However, illiteracy and traditional cultural practices mean that many rural women are still unaware of their rights under the new constitution. Morales and the social movements are striving to overcome the legacies of centuries of colonial and imperialist oppression. Equal gender representation in government, although a significant achievement in any country, is far from a guarantee of equality and freedom for all women. But when that representation is the product of, and embodies leaders of, mass struggles by the poorest and most oppressed women, it takes on deep significance. The women of Bolivia are proving that women can fight and win — for their rights as women and for a radically new type of society based on equality and self-determination by the people. The courageous and inspiring struggles of women and other sectors of the oppressed in Bolivia are part of a global struggle. Bolivian Vice-President Alvaro Garcia Linera used his January 21 inauguration speech to call for global socialist revolutions: "No revolution can triumph if it is not supported by other revolutions in the world. The empire is a global demon, and the only way to defeat it is [by] globalising the power of the people."